A Radial Tent is a membrane wholly in tension, usually lifted up off the ground by vertical supports and held down laterally by pinned connections. Due to their light weight they’re often used as overhead roofs that dissipate flooded natural light down into a space, but they’re also used for many outdoor projects as canopy rooftops or aesthetic elements. They’ve become much more popular in architectural designs over the past thirty years but increasingly so in the past ten. Some radial tents are small enough to be made from a single membrane but the majority of large tent projects are built by stitching together several fabric strips to create the whole membrane. Designing these strips to fit together and match the tensional needs of the whole is a difficult mess without the proper computer tools. Most architectural tents today are afterthoughts of design and are therefore usually outsourced to a company that finds its niche with them, though they have recently started to see more design impact. Material is usually a kind of coated glass fiber fabric because of its ability to be light weight yet relatively stiff, to reflect the sun’s heat, to radiate out during the night and to eliminate electric light because of its translucency. Different projects will use different materials but in general fiber glass is used. Designers will keep this material at a light color instead of painting it darker because the lightness will promote natural light diffusion in the day and illumination at night. Stress within the material gets higher as it gets closer to the middle structural axis, with the highest stress at the very top of the tent. They’re so interesting because their form is a pure derivative of the material they’re made out of and the pinned points it uses as structure. It’s because of this strict physical and engineering planning is required to properly design a radial tent system. Sky Song as built by FabriTec Structures is a beautiful example of the use of lateral force in radial tents. Its use of upward and downward tension within the tent exemplifies the emotions of this kind of structure, the upward motion points to the sky and beyond. It focuses upward and inward until the view explodes at the top into the encapsulating horizon. Yet it’s downward hold keeps it down to earth and part of something stable as well as light. The biggest radial tent in the world is called the Khan Shatyr residential and entertainment center, an indoor city for 20,000 recently opened in Astana, the new capital of Kazakhstan. It incorporates an overall steel structure to support this giant building. 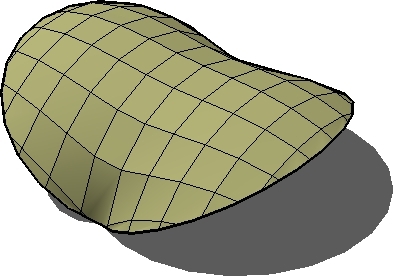 Kangaroo uses structural simulation to predict the resting point of a fabric or membrane under gravity and other pin-points. For use with Rhino and grasshopper. This Maya plugin does well in simulating cloth reactions and interactions with other objects. MPanel provides a complete set of tools to design tensile fabric structures in AutoCAD and in Rhino. It can then translate these structures into two-dimensional panels. MPanel was developed to assist tensile fabric structure designers, but works equally well on other projects, such as tents, awnings, exhibition stands, and inflatable structures. The drawback is that it does not take into consideration the tensile forces within these structures, or at least it doesn’t mention it on their website. WinFabric is a Multimedia Engineering Pte Ltd software product meant to tackle a number of Fabric design problem ranging from “form finding, geometrical nonlinear finite element load analysis, patterning, connection engineering, fabrication and erection.” It accurately predicts the standard shape of a canopy based on it’s structural forces and the stiffness of the material. 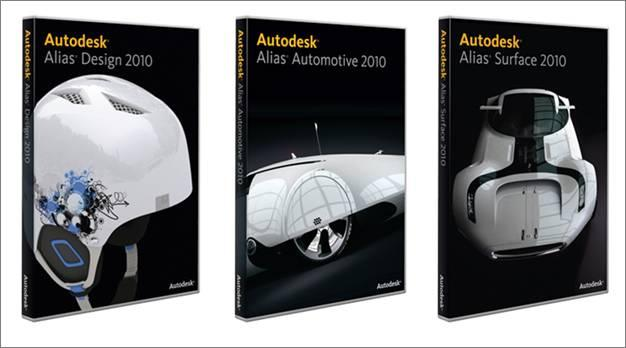 Mainly used by Engineers as an automobile design program but it can form intricate surfaces and analyze the wind and motion forces exhibited against them. Video tutorial of how this analysis is completed attached. 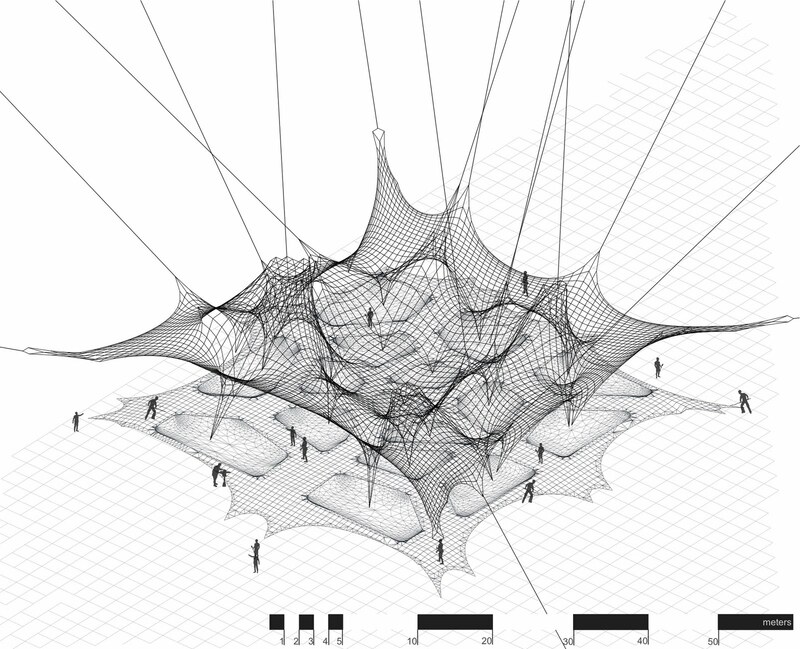 Forten is a full system for tensile structure design, analysis and pattern making. The FEA analysis module is a professional tool with membrane,beams,shells & strut elements within a global non-linear analysis. Included is a professional patterning system for making ready to produce layouts with offsets, welding and prestress compensation. RhinoMembrane is Forten’s attempt at tensile structure and analysis as a plugin for Rhino instead of an independent program. This is a simple Sketchup modeling tool meant to help visualize how a membrane looks early in the design process.